Kids may search differently than adults, but there are some interesting insights from how they use Google that can help deepen our understanding of searchers in general. Comfort levels with particular search strategies, reading only the bold words, taking search suggestions and related searches as answers — there’s a lot to dig into. In this week’s slightly different-from-the-norm Whiteboard Friday, we welcome the fantastic Will Critchlow to share lessons from how kids search. Hi, everyone. I’m Will Critchlow, founder and CEO of Distilled, and this week’s Whiteboard Friday is a little bit different. I want to talk about some surprising and interesting and a few funny facts that I learnt when I was reading some research that Google did about how kids search for information. So this isn’t super actionable. This is not about tactics of improving your website particularly. But I think we get some insights — they were studying kids aged 7 to 11 — by looking at how kids interact. We can see some reflections or some ideas about how there might be some misconceptions out there about how adults search as well. So let’s dive into it. I’ve got this “What do dolphins eat?” because this was the first question that the researchers gave to the kids to say sit down in front of a search box, go. They tell this little anecdote, a little bit kind of soul-destroying, of this I think it was a seven-year-old child who starts typing dolphin, D-O-L-F, and then presses Enter, and it was like sadly there’s no dolphins, which hopefully they found him some dolphins. But a lot of the kids succeeded at this task. The researchers divided the ways that the kids approached it up into a bunch of different categories. They found that some kids were power searchers. 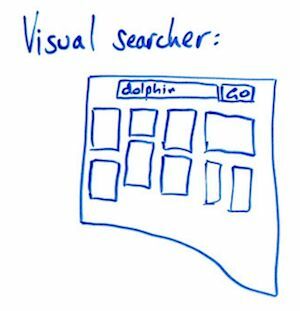 Some are what they called “developing.” They classified some as “distracted.” But one that I found fascinating was what they called visual searchers. I think they found this more commonly among the younger kids who were perhaps a little bit less confident reading and writing. It turns out that, for almost any question you asked them, these kids would turn first to image search. So for this particular question, they would go to image search, typically just type “dolphin” and then scroll and go looking for pictures of a dolphin eating something. Then they’d find a dolphin eating a fish, and they’d turn to the researcher and say “Look, dolphins eat fish.” Which, when you think about it, I quite like in an era of fake news. This is the kids doing primary research. They’re going direct to the primary source. But it’s not something that I would have ever really considered, and I don’t know if you would. But hopefully this kind of sparks some thought and some insights and discussions at your end. They found that there were some kids who pretty much always, no matter what you asked them, would always go and look for pictures. Kids who were a bit more developed, a bit more confident in their reading and writing would often fall into one of these camps where they were hopefully focusing on the attention. They found a lot of kids were obviously distracted, and I think as adults this is something that we can relate to. Many of the kids were not really very interested in the task at hand. But this kind of path from distracted to developing to power searcher is an interesting journey that I think totally applies to grown-ups as well. So I actually, after I read this paper, went and did some research on my kids. So my kids were in roughly this age range. When I was doing it, my daughter was eight and my son was five and a half. Both of them interestingly typed “wat do dolfin eat” pretty much like this. They both misspelled “what,” and they both misspelled “dolphin.” Google was fine with that. Obviously, these days this is plenty close enough to get the result you wanted. Both of them successfully answered the question pretty much, but both of them went straight to the OneBox. This is, again, probably unsurprising. You can guess this is probably how most people search. So there’s a OneBox that comes up, and it’s got a picture of a dolphin. 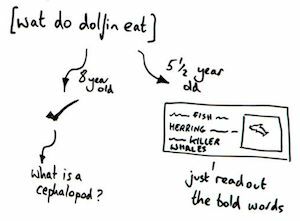 So my daughter, a very confident reader, she loves reading, “wat do dolfin eat,” she sat and she read the OneBox, and then she turned to me and she said, “It says they eat fish and herring. Oh, what’s a cephalopod?” I think this was her going from distracted into developing probably. To start off with, she was just answering this question because I had asked her to. But then she saw a word that she didn’t know, and suddenly she was curious. She had to kind of carefully type it because it’s a slightly tricky word to spell. But she was off looking up what is a cephalopod, and you could see the engagement shift from “I’m typing this because Dad has asked me to and it’s a bit interesting I guess” to “huh, I don’t know what a cephalopod is, and now I’m doing my own research for my own reasons.” So that was interesting. My son, as I said, typed something pretty similar, and he, at the point when he was doing this, was at the stage of certainly capable of reading, but generally would read out loud and a little bit halting. What was fascinating on this was he only read the bold words. He read it out loud, and he didn’t read the OneBox. He just read the bold words. So he said to me, “Dolphins eat fish, herring, killer whales,” because killer whales, for some reason, was bolded. I guess it was pivoting from talking about what dolphins eat to what killer whales eat, and he didn’t read the context. This cracked him up. So he thought that was ridiculous, and isn’t it funny that Google thinks that dolphins eat killer whales. That is similar to some stuff that was in the original research, where there were a bunch of common misconceptions it turns out that kids have and I bet a bunch of adults have. Most adults probably don’t think that the bold words in the OneBox are the list of the answer, but it does point to the problems with factual-based, truthy type queries where Google is being asked to be the arbiter of truth on some of this stuff. We won’t get too deep into that. But some common misconceptions they found some kids thought that the search suggestions, so the drop-down as you start typing, were the answers, which is bit problematic. I mean we’ve all seen kind of racist or hateful drop-downs in those search queries. But in this particular case, it was mainly just funny. It would end up with things like you start asking “what do dolphins eat,” and it would be like “Do dolphins eat cats” was one of the search suggestions. Similar with related searches, which, as we know, are not answers to the question. These are other questions. 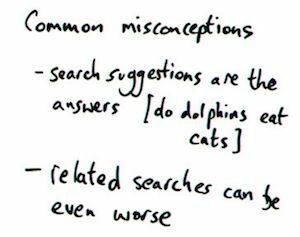 But kids in particular — I mean, I think this is true of all users — didn’t necessarily read the directions on the page, didn’t read that they were related searches, just saw these things that said “dolphin” a lot and started reading out those. So that was interesting. The next bit of the research was much more complex. So they started with these easy questions, and they got into much harder kind of questions. One of them that they asked was this one, which is really quite hard. So the question was, “Can you find what day of the week the vice president’s birthday will fall on next year?” This is a multifaceted, multipart question. How do they handle complex, multi-step queries? Most of the younger kids were pretty stumped on this question. Some did manage it. I think a lot of adults would fail at this. So if you just turn to Google, if you just typed this in or do a voice search, this is the kind of thing that Google is almost on the verge of being able to do. If you said something like, “When is the vice president’s birthday,” that’s a question that Google might just be able to answer. But this kind of three-layered thing, what day of the week and next year, make this actually a very hard query. So the kids had to first figure out that, to answer this, this wasn’t a single query. They had to do multiple stages of research. When is the vice president’s birthday? What day of the week is that date next year? Work through it like that. I found with my kids, my eight-year-old daughter got stuck halfway through. She kind of realized that she wasn’t going to get there in one step, but also couldn’t quite structure the multi-levels needed to get to, but also started getting a bit distracted again. It was no longer about cephalopods, so she wasn’t quite as interested. This I think is a whole area that, as Google’s capabilities develop to answer more complex queries and as we start to trust and learn that those kind of queries can be answered, what we see is that there is going to be increasing, growing search volume in new areas. So I’m going to link to a post I wrote about a presentation I gave about the next trillion searches. This is my hypothesis that essentially, very broad brush strokes, there are a trillion desktop searches a year. There are a trillion mobile searches a year. There’s another trillion out there in searches that we don’t do yet because they can’t be answered well. I’ve got some data to back that up and some arguments why I think it’s about that size. But I think this is kind of closely related to this kind of thing, where you see kids get stuck on these kind of queries. Incidentally, I’d encourage you to go and try this. It’s quite interesting, because as you work through trying to get the answer, you’ll find search results that appear to give the answer. So, for example, I think there was an About.com page that actually purported to give the answer. It said, “What day of the week is the vice president’s birthday on?” But it had been written a year before, and there was no date on the page. So actually it was wrong. It said Thursday. That was the answer in 2016 or 2017. So that just, again, points to the difference between primary research, the difference between answering a question and truth. I think there’s a lot of kind of philosophical questions baked away in there. So we’re going to wrap up with possibly my favorite anecdote of the user research that these guys did, which was that they said some of these kids, somewhere in this developing stage, get very attached to searching in one particular way. I guess this is kind of related to the visual search thing. They find something that works for them. It works once. They get comfortable with it, they’re familiar with it, and they just do that for everything, whether it’s appropriate or not. 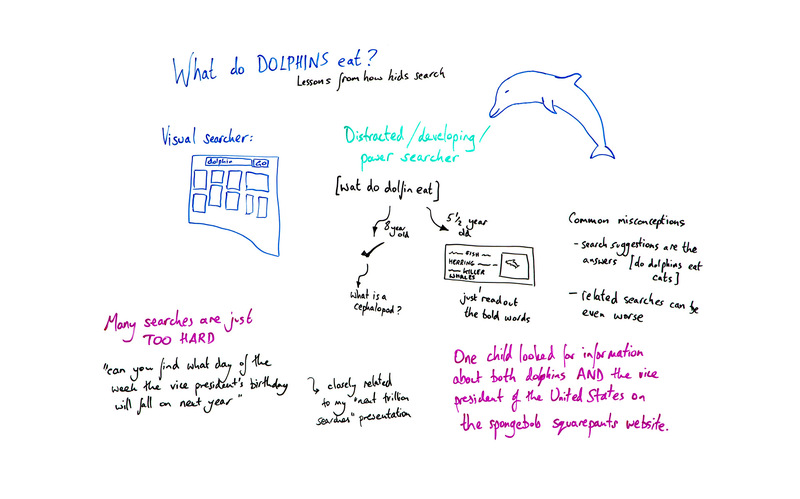 My favorite example was this one child who apparently looked for information about both dolphins and the vice president of the United States on the SpongeBob SquarePants website, which I mean maybe it works for dolphins, but I’m guessing there isn’t an awful lot of VP information. So anyway, I hope you’ve enjoyed this little adventure into how kids search and maybe some things that we can learn from it. Drop some anecdotes of your own in the comments. I’d love to hear your experiences and some of the funny things that you’ve learnt along the way. Take care.